Ten-Ten-Yu is located a 3 minute walk from the Hankyu Line’s “Karasuma” Station. Ten-Ten-Yu’s specialty is their collagen-filled Tori Sayu Ramen, which is a chicken bone broth which is made by boiling chicken and vegetables for 18 hours and drawing out the “sweetness” and “umami (savory flavor)” from the ingredients. Tori Sayu itself refers to the thick white chicken broth. The ramen served at Ten-Ten-Yu only comes in the 2 types, “Chinese noodles” and “Chashu-men,” which comes with lots of chashu pork on top of the ramen noodles. You then decide the broth for your ramen. You can choose from 4 broths, “classic,” “thick,” “black,” and “salted chicken,” and which all have a characteristically smooth flavors that you will never tire of. Having opened in 1971, Ten-Ten-Yu is a ramen shop with a long history in the “Ichijoji” area, where many ramen shops battle for the title of best ramen in Kyoto. Their ramen—which they have protected the recipe and flavoring of since opening, while keeping it modern—obviously has many fans, but has also reached the lofty status of being called the representative of long-standing Kyoto Ramen shops. As their customer service is speedy and on point, the store always has a lively atmosphere. The interior has a modern wooden design, and is popular with people of all ages. The specialty of Ten-Ten-Yu is Chinese Noodles (Classic), a Tori Sayu Ramen cooked in a chicken and vegetables broth. Perhaps because it’s boiled carefully over a long time, but even though it’s a Tori Sayu Ramen, it hardly has any greasiness or bitterness. This ramen has a characteristically smooth broth which goes down very easy. The ingredients are low fat chashu, bean sprouts, and green onions. The crisp and juicy vegetables go extremely well with the Tori Sayu broth. As this ramen isn’t too sharp or too pungent, it’s a great ramen for someone who’s never tried ramen before. With added back fat, this ramen has a bit more flavor than the Chinese Noodles (Classic). On your first taste, you will notice a rich flavor which will remind you of Tonkotsu Ramen. The ramen’s delicious enough on its own, but if you pour a bit of the “Sauce for Chinese Noodles” placed on the table, the flavor will intensify, making the ramen even better. Recommended to those who like thicker ramen. A healthy Shio Ramen made by blending three types of salt. The transparent salted broth even manages to look beautiful in its extreme smoothness. A truly refined dish with perfectly extracted umami from the chicken broth. The ingredients are white leeks, radish sprouts, and thick-cut chashu. The exceptional part of this ramen is the chashu. Although it’s soft enough to bite right through, it has an incredible chewiness that goes perfectly with the smooth broth. Ten-Ten-Yu’s Gyoza are stuffed full with ingredients, making them very filling. There’s gyoza sauce and chili oil on the table as well, so mix and match and find your favorite combination. As the chili oil’s a bit spicy, please be careful not to use too much. There are menus at each table, so have a look through the menu and decide what you want. They don’t generally understand too much English, but you should be able to order by pointing at the menu. 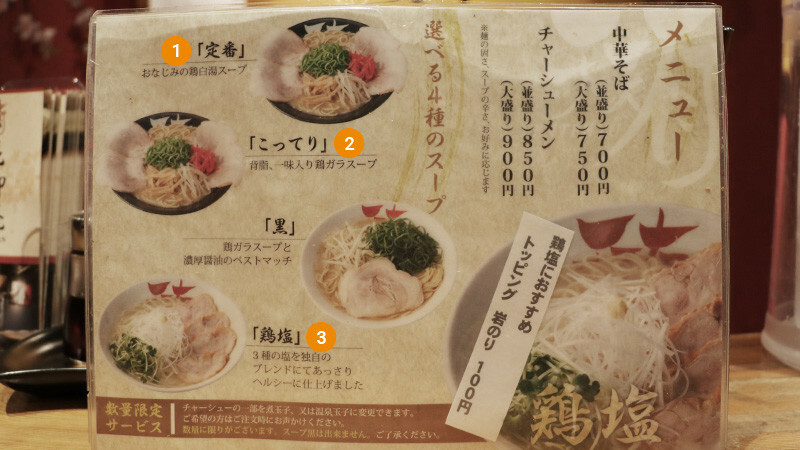 At Ten-Ten-Yu, you can order a large serving of noodles for any of their ramen for only 50 yen extra. If you would like a large serving, please tell the store staff: Oo mori ni shitekudasai. A normal serving should be enough for small eaters and the large servings should do it for people wanting to walk away stuffed. Ten-Ten-Yu is a ramen shop that I loved when I was a student. At the time, it was a popular shop that stood out as top class among the many ramen shops in the competitive Ichijoji. I remember visiting from very far away and waiting in line for over an hour to finally be able to eat there. When I heard the news that they opened a location in the Shijo Karasuma area, I immediately went to go eat there. Perhaps it has evolved into a modern style, as the flavor and atmosphere had changed slightly, but the basic deliciousness has not changed, making me feel nostalgic and happy. As it is located close to my workplace, I still visit there sometimes and remember my student days while eating ramen. Ten-Ten-Yu is a famous and historic shop in Kyoto. The main location is in Ichijoji, but as the Karasuma location always has many visitors from abroad, it is recommended for people who will be eating ramen in Kyoto for the first time. As all of the store staff are friendly, I believe you will have a very comfortable experience. Of course the ramen is very delicious, so if you do not know where to eat in the Karasuma area, please visit here by any means! 3-minute walk from Hankyu Karasuma Station. They can understand basic English.